Insect Omen: Wooly Bear Caterpillar A Sign From Above? When life gets confusing, sometimes you look to the universe for answers or a sign. This is especially true if you’re facing a big life choice, making a major decision, or, like me, looking for a new job.I took our dogs out for a midnight bathroom break the other night, and I noticed a small, black shape on our landing. At first I thought it was a blackened leaf, or maybe a little “gift” from one of the dogs. I bent down for a closer look and the black shadow wiggled. 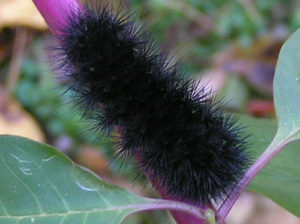 It was a big, thick, fuzzy black caterpillar. It was equal parts creepy and beautiful. I’d never seen one like it before. Where did it come from? Maybe it fell from the trees above. It certainly didn’t belong on our back landing; that was way to close to being inside our house. This multi-legged, furry-backed creature belonged deep in the Great Outdoors. I helped Mr. Caterpillar get one step closer by flicking it into the grass with the end of a broom. It was better suited there among the roots, shoots, and dirt. But after giving the dogs their biscuits and locking up for the night, I wondered if the mysterious black caterpillar wasn’t the heavenly sign I sought. Caterpillars represent change. They mean fall is coming. Some cultures consider caterpillars a sign of good luck and new birth. Caterpillars mean it’s time to start a new project or endeavor, shed the old and welcome the new. 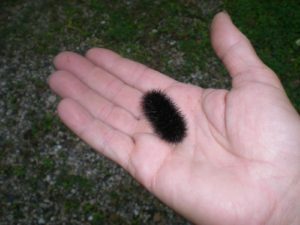 Old farmers claim you can predict the severity of next winter’s weather based on the amount of fuzz on a caterpillar’s back. According to the guy I met the other night, we’re in for a rough one. What was my role in Mr. Caterpillar’s future? Did I sentence him to death by flicking him into our yard, where he might fall prey to birds and other wildlife? Or did I provide him with a “relocation opportunity,” a chance to start over someplace new, a place he’d never considered, a place he would have never reached, without my intervention? Being unemployed gives you time to think (maybe too much!) Sometimes you feel like a caterpillar, or some other creepy bug, lying on a stranger’s doorstep, waiting to be either crushed or brushed aside. Other times you can feel the wings growing on your back, waiting for the right moment to break free and send you soaring skyward. 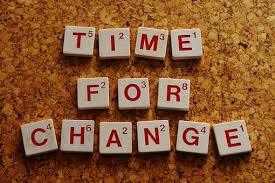 Either way, it’s time for a change.